Our stories capture the full story behind the business leaders, game changers, trendsetters and difference makers in our community. From start-ups to Fortune 500 companies, we cover the ins and outs of business. Stay ahead of the competition and keep tabs on your customers with the stories that you can't find anywhere else. Inspiring events. Exclusive business contact information. 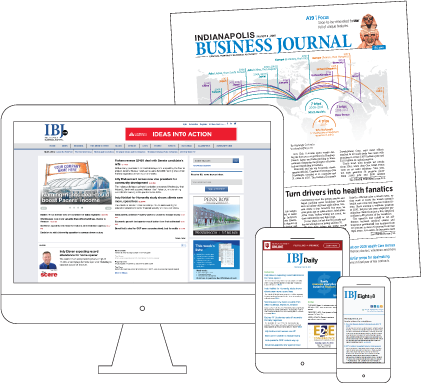 13 targeted IBJ eNewsletters with unlimited access to IBJ content. Award-winning IBJ Print edition delivered to your mailbox every Friday. Includes many special publications throughout the year. * Your subscription will renew automatically at the rate in effect at the time of your renewal unless you notify us 7 days prior to your expiration date. You will receive an email notification from ibj.com when your subscription is due to expire. The subscription fee will be billed automatically to your credit card and you can cancel at any time.